Hand crafted. Magical. Functional Art. Wondering what this life size fairy house looks like inside? Click the video and take the fairy house tour. See how Billy's idea has turned into a magical work of art that will inspire you and could be exactly what you're looking for! The Enchanted Fairy House is a magical place to ignite your creativity and Imagination. What fairy tale books or movies have you watched and seen a fairy house and said to yourself, "I would love to have a fairy house like that." Well, now you can! Can you imagine how beautiful the fairy house stained glass window will look with the interior light on? Once you step over the threshold, you'll enter into a different realm where you have left your worries behind. 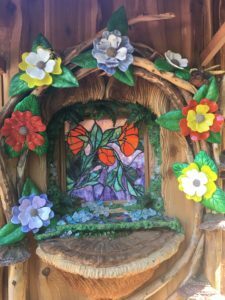 The life size fairy house is functional art that gives you a space to connect with your emotional and spiritual self. If there is any questions you have about the Enchanted Fairy House, please go to the contact page and fill it out and let Billy know if you would like to talk to him on the phone or by email. Thanks for being here, plan a visit to see the life size fairy house in person soon.